There is no admission cost to attend the party, however, we are looking to raise $500 towards basic party supplies and gifts for Chris. Any money over our goal can help others in need of support through the 501(c)3 Cherab Foundation which is the volunteer-based organization behind CrowdFunnit. Since 2000, Cherab Foundation has been providing evidence-based and integrative approaches to help children with therapy, nutrition, socialization/anti-bullying, and awareness. Every dollar helps. Thank you in advance! As an honored guest, you are invited to have a super time at SuperPlayUSA. Free tickets here. Admission is free to enjoy the entertainment, numerous special guests, and Superheroes, but please RSVP for your free tickets anyway prior to the party to help us plan accordingly to provide a count to Superplay, Duffys, and the baker Seriangely’s Sweet Inspirations so there is enough room, food, and delicious birthday cake. Thank you in advance! Celebrate Chris’s birthday and stay as long as you want to play! Like all children, each year Chris wanted a birthday party with friends, but for the past seven years, he has celebrated only with family. “We spent hundreds of dollars on his birthday parties,” said Mary. “Chris waited and waited, and nobody came.” It’s been heartbreaking for Chris who desperately needs to know that he is worthy of having friends and that he is not alone. Last summer he and his father attended the crowdFunnit celebration for William Morales in Port St. Lucie, FL and seeing a child that had been bullied have a party like that his hopes did a 180. 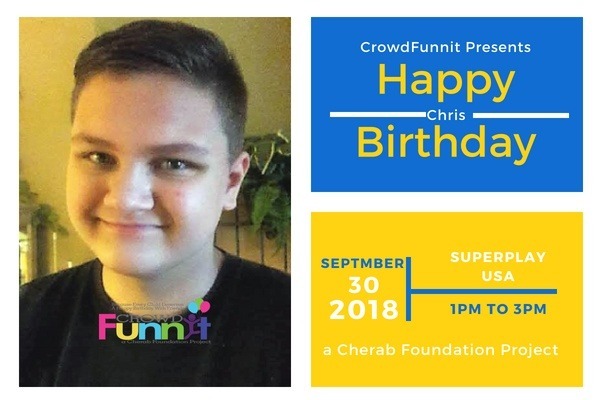 Now Chris will be the guest of honor at his own crowdFunnit party and welcomes the whole community to join him, on Sept 30th, 2018 to celebrate all those individuals and families out there feeling the same alienation. Inspired by previous crowdFunnit events, Mary Ramirez reached out on behalf of her son. “I have watched Chris go through so much heartache dealing with how he is different from other children his age. He fears leaving his home when other children want to spread their wings,” she said. Chris loves gaming and computers. He also loves swimming at the beach or pool, animals (his cats) and science. He loves to watch Mythbusters on TV with his older brother. Chris and crowdFunnit are calling all kind-hearted people interested in making friends. “I want there to be a common ground where he and others like him can feel safe to be themselves, do activities and enjoy life,” Mary said. crowdFunnit and the Ramirez family welcome families in the same situation as Chris’s family to share their stories and join us at the party. Please contact us and we can help Equally important is the presence of compassionate individuals and families of all ages to come out and join the fun, share some cake and make a few new friends. For those unable to attend – we have firsthand knowledge that Chris loves receiving mail! Past years he’s received just a few cards from family. This year help us show Chris he’s loved by so many by upping that number to a few hundred. Send Chris a birthday card! The Cherab Foundation has partnered with CardFool making it quick and easy for you to share your personal wishes with Chris without even leaving your computer. Cardfool allows you to personalize your greetings and will mail your card directly to Chris, donating the net proceeds of your purchase back to the Cherab Foundation. Your donation will, in turn, allow us to help even more children. If your child is being bullied or alienated, please contact us for help. We also appreciate any donations to help us with our mission. We are a grassroots 100 percent volunteer-based 501(c)3 Any donation is appreciated. Thank you so much and keep updated by our Facebook page or here at the Cherab Foundation. Volunteer based since 2000, the Cherab Foundation is a 501(c)3 nonprofit for children with neurological or genetic impairments that affect communication with a focus on Autism and Apraxia. With your help, we can reach our goal to host at least one party every single month across all 50 States! We are also launching a school-based program right here in South Florida, with a goal to reach every district in the country. This new program will expand upon the tools we've developed to encourage acceptance and compassion within their daily school environment where we feel the impact will be greatest. Thanks for the support and helping to make a difference by supporting the Cherab Foundation anti-bullying event for Chris! For Chris Ramirez's Cherab Foundation crowdFunnit birthday party coming up this September 30th, we are giving him another reason to smile We will have a special live appearance by National Recording Artist JessLee who was recently Team Blake on The Voice!